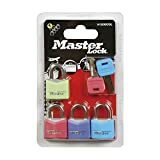 TSA（Transportation Security Administration） Approved Lock: Allows TSA screeners to inspect and relock baggage without damaging the lock, for added security. Convenient : Simple and efficient. You can set your own combination in about 30 seconds with our written and video instructions. Never leave your luggage unprotected again! Material: durable zinc alloy . Sturdy with Lifetime Warranty! 1 Easy to use and made of high quality zinc alloy for maximum protection. You can Personalize a combination ,no need for keys anymore. 2 Flexible cable lock resists abuse from luggage handling equipment. 3 Specially designed for securing luggage, briefcases, purses, cabinets, toolboxes and other low security application. 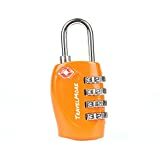 4 Mini, compact and portable Travel Combination Padlock lets you set your own secret number anytime without tool.